Enjoy riding with others who share your interest in cycling. Meet new friends. Improve your cycling skills by riding with more experienced riders. Collectively, we have a wealth of cycling information that you will pick up just by riding with us! Discover new places to ride and explore. Distinguish practical vs hype about equipment and gear. Understand what matters for different kinds of riding (road, trail, commute, touring, etc.). We have good stuff for everyone! Routes vary from less than 10 miles to 100 miles (or more). There are plenty of flatter riding areas close to Lake Ontario, but the glaciers left us challenging climbs in the south. 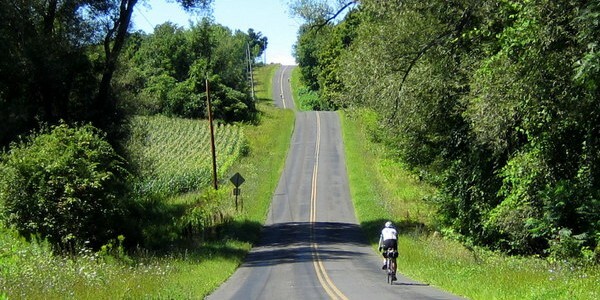 Our ride contributors have linked the best, low-traffic roads to create spectacularly beautiful and enjoyable rides. In between are many combinations of short/medium/long, flat/moderate/hilly rides, truly something for everyone! Our ride maps are digitally drawn and illustrated PDF documents, along with cue sheets and gpx files. Weekend rides are scheduled April through October and weekday evening rides run all summer long. Rides can be added year round whenever weather is good. During peak season, many rides are also held during weekdays, which is great for retirees but also for anyone who wants to take a day off now and then. You can find our ride calendar on the website or RBC Meetup. Cycling is a great aerobic exercise and is easy on our joints (low-impact/non-weight bearing). The more you ride, the fitter you get. Longer distance, moderate intensity cycling is particularly effective at burning calories. Members can attend clinics on topics such as basic bike maintenance and repair, how to fix a flat, and cycling safety courses. Details can be found on our website or RBC Meetup. The RBC owns several hard shell bike travel cases that members can rent for a small fee. Rochester has great bike shops and most offer RBC members discounts on bikes, clothing, parts, service, and accessories. Show your RBC membership card at checkout to save. Savings from discounts can pay for your membership! If you ride a bike, it PAYS to be a member and it PAYS to support your LOCAL bike shops! RBC is a member of the League of American Bicyclists (LAB), and purchases insurance coverage through them. As a result, our members are protected when leading or participating in club rides. The Member Forum enables online discussion of anything cycling related. Members can also place cycling related classified ads. RBC produces the Flower City Cyclist newsletter 10 issues each year. Members receive an email with a link to the latest issue. Members are encouraged to submit articles, event information, and bike related sale items for inclusion. Members have access to the private area of the RBC website. This is where you find our extensive map collection, the Member Directory, and Club documents. Spring Awards Banquet: We kick off the riding season with a short ride followed by a dish-to-pass banquet and awards presentation. Awards cover riding accomplishments as well as fun topics for those humorous moments that pop up throughout the season. Andrew Spiller Memorial Challenge Ride & Picnic: Each summer we organize a picnic at a park shelter, bring dishes-to-pass, and set up several different length loops so members can ride, eat, and socialize all day long. Fall Banquet and Volunteer Dinner: This special catered dinner invites *all* members to come and celebrate the past riding season together. In addition, we recognize all those who volunteered (i.e., leading rides, writing articles, representing club at events, etc.). Volunteers attend for free. Fall Elections: This is mostly a social gathering, but is also the one and only RBC general membership business meeting each year. The officers for the coming season are elected at this gathering. Winter Multimedia Show: Here is the chance to share your bike trip adventures with others or sit back and enjoy the show. Come join us for several travelogues and start dreaming about YOUR next big bike adventure!